Mutual fund giant Fidelity made its first sizable foray into the exchange traded products industry today with the debut of 10 sector ETFs. BlackRock (BLK), the largest U.S. asset manager, is the sub-advisor for the Fidelity sector ETFs. Popular sector SPDRs such as the Financials Select Sector SPDR (XLF) and the Consumer Staples Select Sector SPDR (XLP) charge 0.18% per year. Bottom line: The big news with the launch of Fidelity’s sector ETFs may not be so much that Fidelity has significantly bolstered its ETF presence, but that it is charging less than Vanguard. 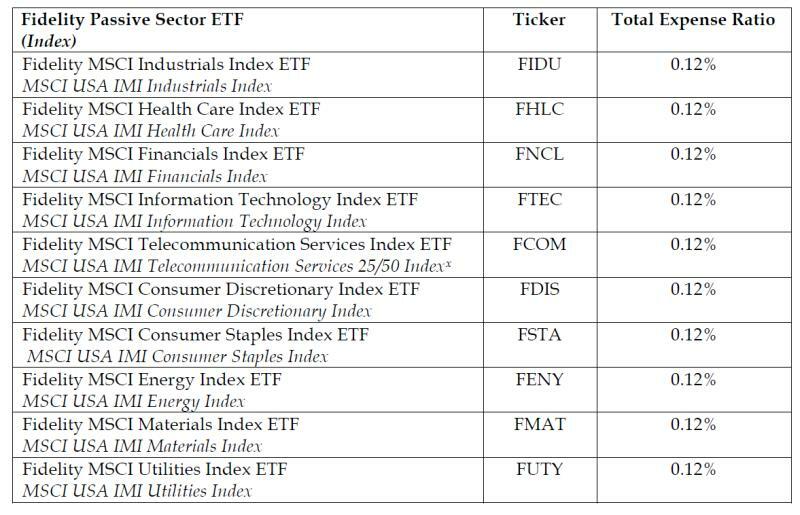 The 10 Fidelity sector funds, featured in the chart below, charge 0.12%, per year. All of the ETFs are listed on the New York Stock Exchange.